Arvind Kejriwal retweeted a picture by self claimed RTI activist named Abhishek Mishra, Arvind Kejriwal claimed that Modi is responsible for this murder. The table turns out Delhi CM Arvind Kejriwal once again. One of the most controversial Chief Minister, Kejriwal had today sparked up the controversy once again by politicising one more suicide but failed miserably as BJP supporters gave him foot in the mouth moment. Arvind Kejriwal retweeted a tweet of one Aam Aadmi Party follower on the twitter politicizing the situation just by seeing image of a person hanging in the bank. Being irresponsible to his duties as a Chief Minister of state he didn’t even cared about verifying the news. And this is how a twitter user exposed the claim by giving screenshot of newspaper website, claiming The person was a thief and suicide inside the jail because of failed attempt while stealing money. Earlier Abhishek Mishra used to upload pro Modi videos but later he turned out himself as part of AAP after meeting Delhi CM. Recently Arvind Kejriwal did a rally with Mamata Banerjee announcing complete blackout of new policies announced by Indian Govt. The duo had refused to support PM Narendra Modi in drive against black money by changing old notes of 500 and 1000 rupees. At the same time BJP supporters had questioned his integrity. Many supporters of Narendra Modi starts reminding him why he failed miserably in Lok Sabha elections wanting to be a prime minister. 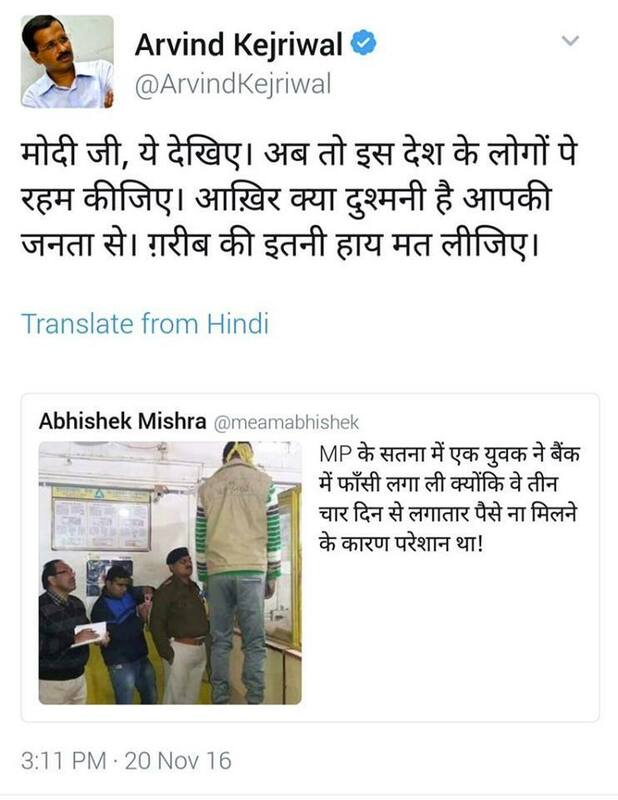 Abhishek Mishra deleted his tweet later on but rumored tweet was not deleted by Delhi CM yet.